Background and Objective: The present work discusses the use of alkalizer based solid dispersion approach for solubility enhancement of Ibuprofen (IBP). Ibuprofen, a BCS Class II drug shows dissolution rate limited absorption and pH dependent solubility with higher solubility above pH 6.8. The poor aqueous solubility of IBP affects drug absorption and hence, therapeutic response as the drug is indicated in arthritis, pain conditions where rapid onset of drug action is essential to maintain functional ability. Methods: Solid dispersions of Ibuprofen were prepared by melt granulation technique using PEG 6000. The solubility of IBP in PEG 6000 was further improved by incorporating alkalizer which modified the micro environmental pH. 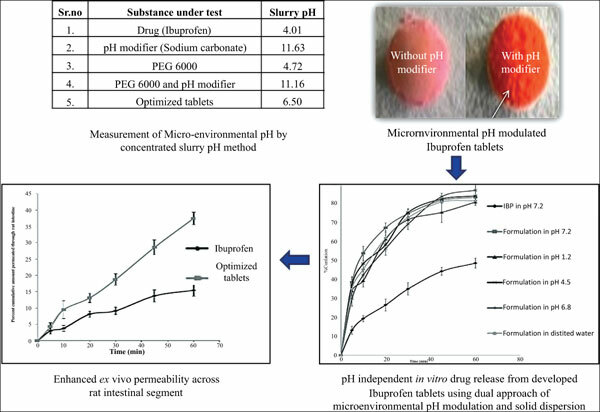 Immediate release tablets of IBP were developed which showed pH independent drug release and significantly improved the rate of dissolution as evident from in vitro release and ex vivo permeation studies (Permeability co-efficient for pure drug and optimized tablet formulation were found to be 0.2044 and 0.6205 respectively). DSC and XRD studies indicated conversion of drug to an amorphous form which demonstrated solubility enhancement of IBP in the PEG melt with alkalizer. Conclusion: The developed formulation due to enhanced solubility and pH independent drug release can be absorbed in the gastrointestinal tract irrespective of the effects of physiological pH on drug solubility. Thus, the alkalizer based solid dispersion technique can prove beneficial in improving aqueous solubility and hence bioavailability of drugs. Keywords: Melt granulation, alkalizer, Ibuprofen, PEG 6000, solubility enhancement, solid dispersion. Keywords:Melt granulation, alkalizer, Ibuprofen, PEG 6000, solubility enhancement, solid dispersion. Abstract:Background and Objective: The present work discusses the use of alkalizer based solid dispersion approach for solubility enhancement of Ibuprofen (IBP). Ibuprofen, a BCS Class II drug shows dissolution rate limited absorption and pH dependent solubility with higher solubility above pH 6.8. The poor aqueous solubility of IBP affects drug absorption and hence, therapeutic response as the drug is indicated in arthritis, pain conditions where rapid onset of drug action is essential to maintain functional ability.